Introduction. Chapters: I. The Techniques of the Study of Movement (N. Bernstein). Ia. The Unit of Analysis (R.B. Wilberg). Ib. On Methodology in the Study of Human Movement (H.J. Woltring). II. The Problem of the Interrelation of Coordination and Localization (N. Bernstein). IIa. Frequency Encoding in Motor Systems (K.H. Pribram, A. Sharafat and G.J. Beekman). IIb. From Action Gestalts to Direct Action (E.S. Reed). III. Biodynamics of Locomotion (N. Bernstein). IIIa. How Control of Movement Developments (C. Trevarthen). IIIb. Biodynamics of Locomotion, Forty Years Later (R.H. Rozendal). IV. Some Emergent Problems of the Regulation of Motor Acts (N. Bernstein). IVa. An Ecological Approach to Perception and Action (M.T. Turvey and P.N. Kugler). IVb. Some Computational Solutions to Bernstein's Problems (G. Hinton). V. Trends and Problems in the Study of Investigation of Physiology of Activity (N. Bernstein). Va. Bernstein's Purposeful Brain (J. Requin, A. Semjen and M. Bonnet). Vb. Towards a Holistic Conception of Movement Control (L. Pickenhain). VI. Trends in Physiology and Their Relation to Cybernetics (N. Bernstein). VIa. From Synergies and Embryos to Motor Schemas (M.A. Arbib). VIb. Control Theory and Cybernetic Aspects of Motor Systems (G.C. Agarwal and G.L. Gottlieb). References from Original Text of Bernstein. Author Index. Subject Index. 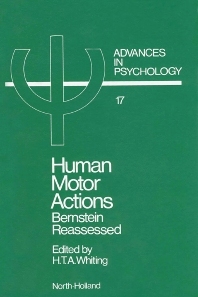 Under the title The Coordination and Regulation of Movements, an English language version of six of the most important papers of the Russian physiologist Nicholas Bernstein was published in 1967 (Pergamon Press Ltd.). That work has been out of print for some years, but in view of the frequency of its citation in recent works on movement control, a republication was considered desirable. However, since some of the papers in the first edition were written in the 1930's, it was felt that readers' interests would be better served if, after each chapter, an evaluation of the work and, where necessary, an update of the data in the light of more recent findings was included. Contributors of international renown provide such chapters.